We see a rubber raft surrounded by water. The size and color of the waves suggest that the boat sails on marine waters. It is densely packed with people standing upright, arms linked. The expression on their faces is serious and concerned, but they stand together as one, ready to face whatever awaits them. Some look around, others down into the waves. A few appear to be aiming their gaze at us. Their clothing—mostly dark blue or grey suits or dresses with dark overcoats—doesn’t seem to match a boat trip. One wears a hat. As these passengers face the side of the boat instead of the front, it’s unclear whether the boat is arriving or departing. Nor is it clear whether it is being steered or if it’s aimlessly adrift. We’ve seen these people before, even in this formation, and we have seen the boat before, yet the two don’t seem to fit. They temporarily cohabit the image as in Rabih Mroué’s performance The inhabitants of images, in which people or things from one image decide to visit other people or things in another because they have business together or urgently need to talk. The people in the photo are “world leaders,” heads of powerful states such as France, Germany, the United Kingdom, and Israel. We recognize Angela Merkel, François Hollande, and David Cameron, among others. Usually we see leaders on ships or boats only in situations of war or leisure. Maybe, most famously, we recall the depiction of George Washington crossing the Delaware to fight the Hessians in Trenton. Washington, too, was standing in a vessel, but he looked ahead, purposefully, toward the coming battle. Perhaps another image from the leader/ship trope etched into our memory is President George W. Bush’s “Mission Accomplished” photo op on the deck of the aircraft carrier USS Abraham Lincoln, where he addressed the nation to say that all major combat in Iraq had ended on May 1, 2003, just forty days after the start of the invasion. 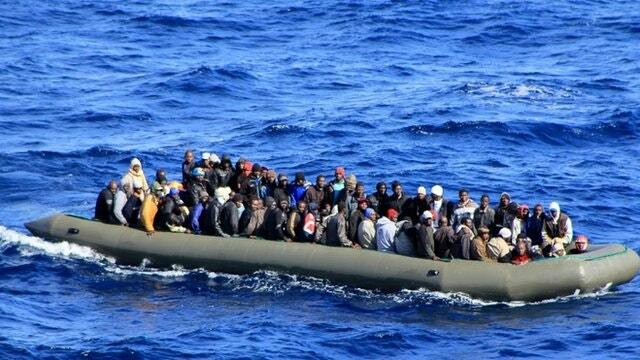 But the rescue operation was also terminated in order to discourage people from trying to reach European soil. Frontex head Fabrice Leggeri holds the view that saving migrants’ lives in the Mediterranean should not be the priority for the maritime patrols of Triton, while Klaus Rösler, director of Operations Divisions of Triton, is even more outspoken. He criticized Italian authorities for sending vessels into zones outside the operational area of Triton to rescue people in distress at sea. In Rösler’s view, the rescue missions didn’t “correspond to Triton’s operational plan” and would just encourage more people to make the journey. In Frontex’s own concept paper, Triton’s aim is described as “controlling and combating illegal migration flows and other cross-border crimes”—that is, its mission is to stop people from crossing into Europe, not save them from drowning. But since November 2014, when Mare Nostrum was cancelled and Triton began, the number of people taking this risk has remained the same—while the death toll has risen dramatically. Italian Prime Minister Matteo Renzi blames human traffickers for these tragedies, dubbing trafficking “a plague in our continent—the slavery of the 21st Century.” The fact is the European Union has made it impossible for people from regions of crisis, war, and poverty to reach its borders in legal ways. The only way left to make this journey is with the help of people smugglers. Renzi intentionally levels the differences between trafficking and smuggling in his statement in order to scandalize and criminalize the act of aiding refugees. This is “a new slave trade,” he says in a factually incorrect statement that serves as an image of injustice. While it’s correct that most smugglers receive money for their more-or-less helpful assistance in the crossing, they don’t sell or buy the refugees as property. Renzi’s phrasing is in itself scandalous as he tries to use the image of African people on a boat to evoke the image of a slave ship. If this is the reference that comes to his mind when he sees people of color on a vessel, it is in fact an utterly racist remark and an expression of an utterly racist migration politics. Smuggling is not the problem; the militarized European border is. To prevent people from reaching European soil in order to claim protection under the 1951 UN Refugee Convention and apply for asylum, the EU chooses to accept the deaths of that many people. This position is clear in the ten-point response plan that the EU established after the April 20 disaster. • instituting fingerprinting of all migrants. None of these points refers to rescue operations or to an acknowledgment of the UN Refugee Convention and the right to asylum. One can only assume that it is in fact an intentional and systemic ignorance. None of the so-called world leaders acknowledges that their countries are involved (and, in fact, responsible) in various ways for the multiple crises that are spread across the African continent and the Middle East. Weapons sales, aggressive export policies, and agricultural dominance—not to mention interference and cooperation with dictators across Africa and the Middle East—make Europe responsible for some of the difficult living conditions in those regions. The apparent amnesia about the connection between the two sets of problems (economic, political, and military interference and the influx of refugees) is in reality a denial of responsibility. It is a sickening double standard that is becoming increasingly apparent on many levels. Austerity, privatization, segregation, the dismantling of social welfare programs, and the militarization of police and border control have all supported the exclusive interests of the one percent. Enough with equal rights, with equal chances, with fair distribution of wealth, health, rights, water, air, and life. We are officially at the point where one life matters more than another—and where this valuation depends on your skin color, your passport, where you happened to be born, and other factors that are beyond your range of decision-making. The so-called world leaders have demonstrated this double standard increasingly and on multiple occasions, even before they consciously and intentionally decided to let people drown by the thousands and then have the audacity to blame it on smugglers. The source image for the world leaders on the rubber raft is from the unity march in Paris after the attacks on the Charlie Hebdo staff. The carefully choreographed photo became famous because the dignitaries seemed to be leading the march of millions of Parisians, when in fact they had gathered for a photo op in a protected side street. They weren’t marching for freedom of speech, as they claimed; rather they were demonstrating their unity in fighting any power that challenged their leadership. While marching as one in Paris, they were busy hindering and threatening investigative journalism, putting whistle-blowers and activists behind bars, and even giving tacit approval for the United States’ kill lists of people whose speech they perceive as inciting violence or simply against their interests. The dismantled photo op of the leader’s march was read as an accurate visual representation of their hypocrisy. But beyond that, let’s carefully look at their gesture. We see these people marching with arms interlocked, like real demonstrators, with their faces showing concern, determination, and their apparent support of the slogan “Je suis Charlie,” even though we don’t see them carrying signs to that effect (the Paris rally marched under this banner). Leaving hypocrisy aside, it is seriously problematic when Merkel, Cameron, and Netanyahu claim to “be Charlie”—because by definition they cannot possibly be Charlie. Their position does not allow for ambivalence of identity, capacity, or assignment. As Michael Taussig pointed out in his book Defacement: Public Secrecy and the Labor of the Negative (Stanford University Press, 1999), only the revolutionary has the option to change her name or wear a mask, while the sovereign always has to stick to the very name he has defined. So when Angela Merkel claims to be Charlie, she does something other than express her solidarity: she makes Charlie a state affair, subjugating his identity into a totalizing image of the world as one under one set of values that are seemingly universal. She actually devours Charlie. Maybe the very technique of expressing solidarity by claiming to be that other person (“I am X, je suis Y”) has actually come to an end of its potential exactly in the moment of making “Je suis Charlie” a state affair. It died when Merkel, Cameron, and Netanyahu swallowed it. But back to the boat. We have a memory of images. And the images have memories of each other and of us. They remember and call one another. They linger in the realm of unsolved problems, of injustice unaccounted for, of double-standard leadership, of crisis and war. And sometimes they suddenly gather or eject like vomit or spill from this pool of data and memory that we have collectively been making and participating in. Then they appear on our feed as unstable but precise rectifications of the sickening spam that we’re constantly bathing in. They are corrected images, photoshopped to put things together that are usually held apart, and to visualize the actual mess. The boat image is one of these corrected images. The person who photoshopped it has left no traces of authorship or copyright claims before he or she committed it to the collective feed. The mash-up photo brings together a boat that had landed in our news feed a few days earlier full of exhausted people who were rescued from the Mediterranean, but it replaces the passengers with these Charlie-devouring leaders. It is up to us now to sink this boat.